The perfect bag for jeans! Light blue with brown stripes. Two stripes of interesting textured brown yarns and matching brown stone handles. Ablue and brown glass button matches perfectly. Light blue fur trim. Approximate dimensions 7 (h) 9 (w) 4 (d). Shed your eyes- this bag is blinding! 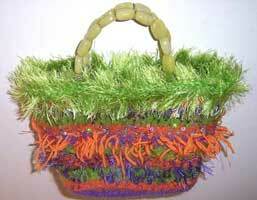 Bright green fur and green stone handles with stripes of orange and purple. Wild orange eyelash and sequins put it over the top! Approximate dimensions are 7(h) 9 (w) 4 (d). Look out here I come. 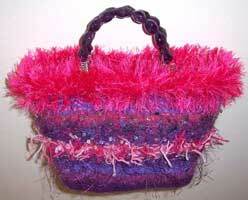 Bright pink fur with pink and purple stripes. Amythyst bead handle and sequins complete the look! Approximate dimensions are 7(h) 9 (w) 4 (d). Fabulous maroon and burgandy handbag with black trim and maroon crystal bead handles. A black button completes the package! Approximate dimensions are 7" (h)X 9" (w) X 4 "(d). 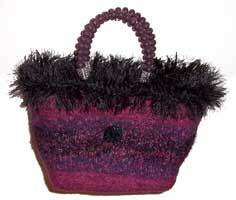 Beuatiful maroon and navy bag with rich blue fur and beautiful amethyst handle. Silver sequins add a little sparkle. Approximate dimensions 7 (h) 9 (w) 4 (d). This handbag will make you feel like you are in Monet's garden in Giverny watching him paint. 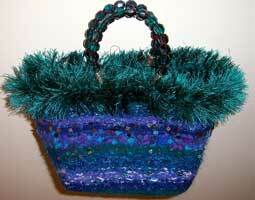 Blues, greens and purples with some sequins for pizazz. 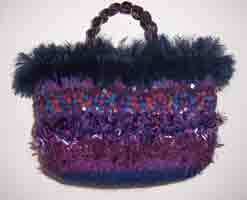 A two tone green and purple crystal handle and green fur top off this bag. Approximate dimensions are 7(h) 9 (w) 4 (d). 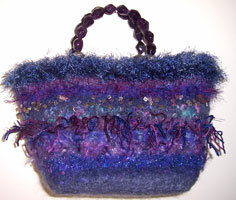 Blue and purple handbag is perfect for jeans! 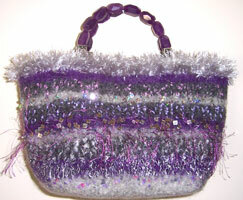 Amethyst handles and silver sequins give it flair. Bluish fur trim. Approximate dimensions 7(h) (w) 4 (d). Muffy- look out girl- here you come! 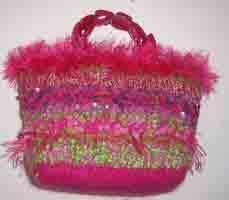 Bright pink and green handbag with lots of silver sequin sparkle. Heavy pink beaded handles and pink fur and eyelash. Approximate dimensions 7(h) 9 (w) 4 (d). 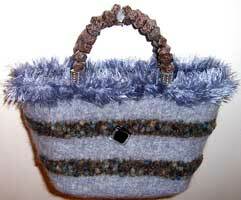 Beautiful shades of grey combine with vibrant purple to create this sophisticated bag. Beautiful purple stone handles and silver sequins complete the image. Approximate dimensions 7(h) 9 (w) 4 (d).